When living or visiting such an amazing place like Wanaka, New Zealand, it is hard to miss the amazing views of the mountains and water. When on the ground the mountains look amazing, but when in the air and looking from above, there are no words to describe it! A sea of greenery dusted with a light sprinkling of snow. The line where land meets the sky. Alpine Heli brings the mountains to life. 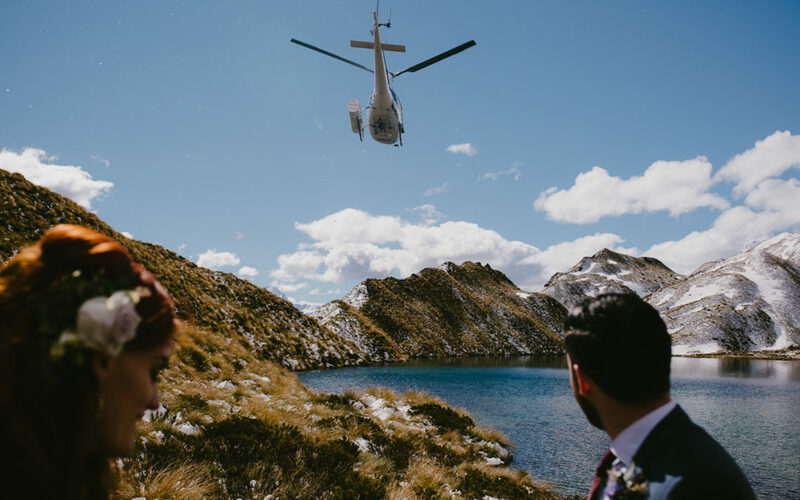 When looking for Wanaka Wedding Activities, Alpine Helicopters needs to be top on your list of to-dos. The first wedding package is the Alpine Scenic Wedding. This takes you to Mount Roy located on the breathtaking Coromandel Peak. An hour on the Coromandel allows you to capture all the images you want and gives time to soak in the scenery. Alpine Heli will even pick you up from your venue or lodge located in Wanaka and Queenstown. The second option is the Twin Peaks. Situated West of Wanaka on the Minaret Station, this private area will provide views of all of the Southern Alps, Lake Wanaka all the way to Roys Peak. Wedding photos with a backdrop such as that are astonishing. The third option, Snow Landing, allows two stops for double the photo opportunities. Alpine Heli first flies you to Mount Roy for 30 minutes, then you carry on to Isobel Glacier for another 30 minutes. Two locations for two different backdrops. Your photos will be absolutely hair-raising! The next choice is the Remote Beach Wedding. This fourth option is more than a full package. Alpine Heli will fly you to the West Coast, to an exculsive beach where there will be wedding opportunities everywhere. From the surrounding scenery to the crashing waves. After you take your pictures the team at Alpine Heli will take you for lunch or your reception at The Mountain Kitchen at Minaret Station. Alpine Heli will Cater an experience to remember, with cocktails and buffets options available. Minaret Station Alpine Lodge is a wedding venue that is positioned in a “wilderness paradise”. This lodge allows for a high country wedding still with all of the glamour. This wedding reception has a number of options ranging from a grand ceremony to private and exclusive. Their Mountain Kitchen can serve it all. Alpine Heli offers many other packages that always ensure an amazing experience. There dedication to hard work and providing amazing scenery shows through their Qualmark Gold Accreditation award. To experience this world-class adventure you can visit the Alpine Heli page here.